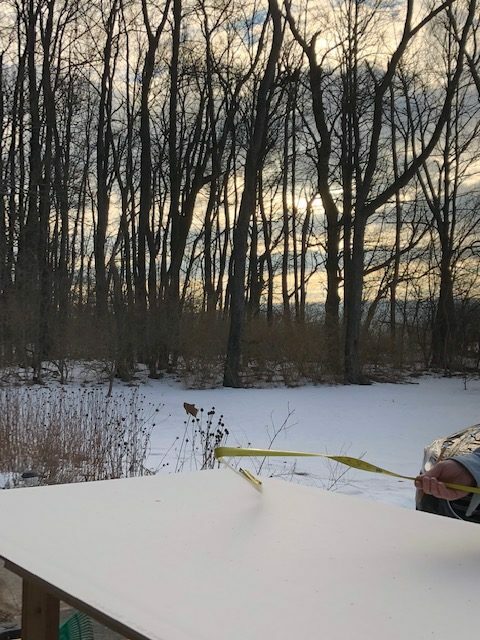 After a few days of Spring, the Winter weather has returned to Central PA. We made the most of the post-polar vortex reprieve and got much of the drywall up in the garage.I loved being able to get outside early enough that we could watch the tail end of the sunrise. 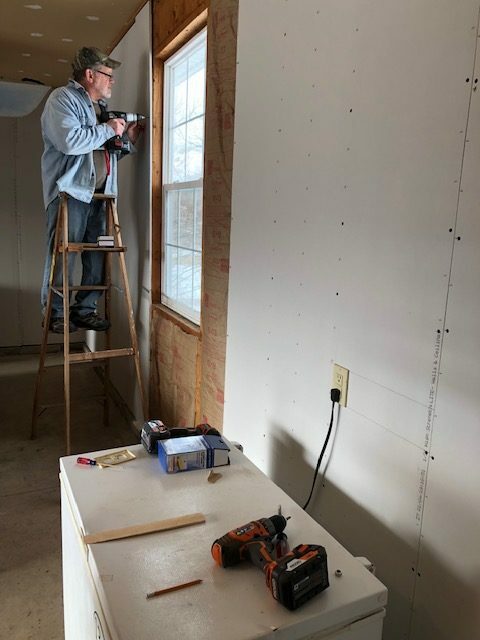 The whole back wall is now done and only a third of a sheet is left to do by the garage door. The console/sofa table has been an experience. It will apparently take three parts to really share the experience of making it. Part II is focused on how much harder it was to get the pieces of wood lined up in the herringbone pattern than I anticipated. 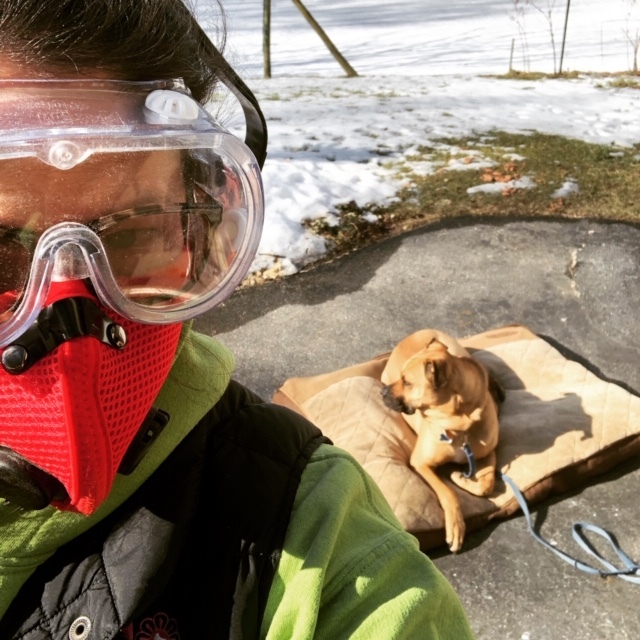 First, Fargo and I got the round 1 sanding done, and I didn’t even have a coat on! Once the sanding was completed, I had some interesting hours. It was all fun and games when I was just laying the pieces of wood out to make sure I cut enough. 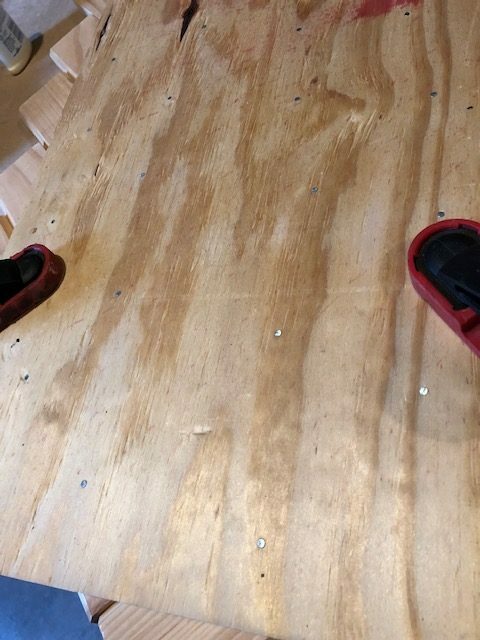 Actually lining them up so that the centers didn’t travel off to one side of the plywood or the other was a different story. 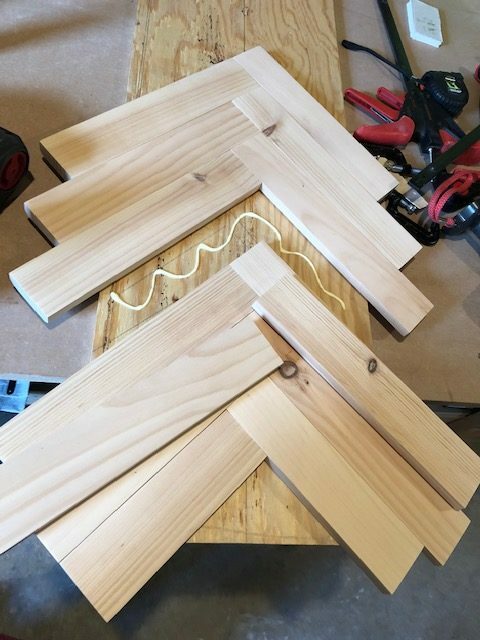 I used clamps on two pieces in the middle. I then lined the rest of the boards in place above and below. It was so frustrating that I had to walk away for a bit and come back to it. It would definitely have been easier if I had just cut the angle on the center edges and lined them up on the middle line. This way, not only did I need to line it up even from both edges, but the tilt had to be correct as well. Once I FINALLY got to the point where it was as centered as possible, I tightly clamped the two middle pieces in order to permanently affix them in place and use them as a guide. I actually flipped the board over, nailed those two pieces from the bottom, crossed my fingers and began the glue-up process. 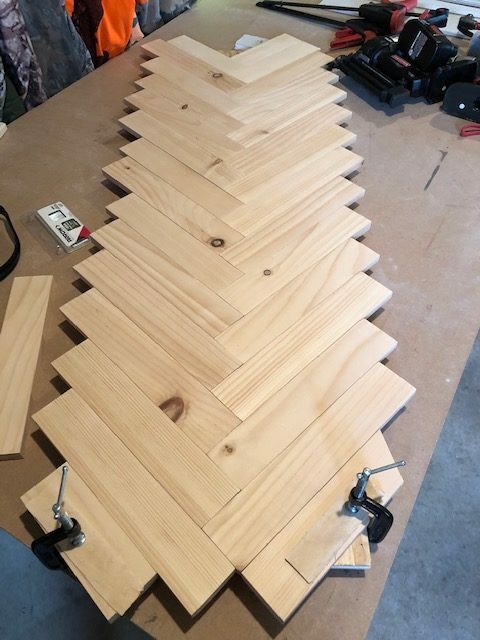 As an extra measure to secure the herringbone pieces to the plywood, I nailed all of them to the board from the back. I honestly have no idea if that was a good idea, or not, but I was just too nervous they would fall off. 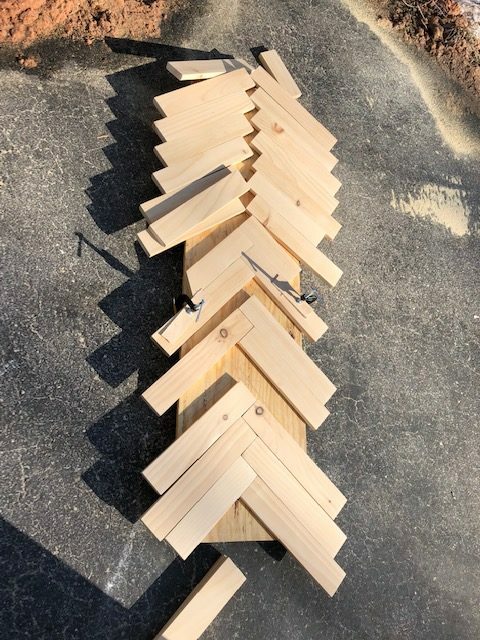 Now that all but the smallest pieces are attached, I’m hoping to use the circular saw today (once temps get into the 20s) to trim the herringbone pieces to the size of the plywood. I’ll then use the scraps for the remaining open spots. Hoping the circular saw and I get along well. In between, I’m still doing yoga (and Fargo is still fighting me for the mat), and I’m still stopping to take some pictures (mostly from indoors). 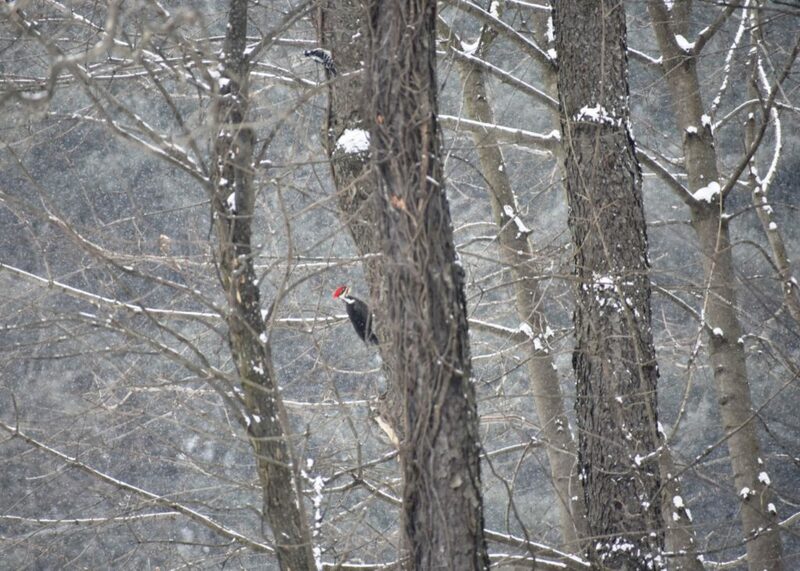 Had a pileated woodpecker stop by the back yard. I’m ready to get the final sanding on the table done and start staining it. I submitted my table project to the Weatherwash Brand Ambassador program and it was accepted, which I’m pretty excited about. They sent me the Oaked Stain, White Maintenance Oil and Satin Varnish for free to use on the table in exchange for some social media postings and pictures to help with their company promotion. Given that I started using their products for the bed and nightstands and how much I love the results, it’s super cool to be working with them on the table. This entry was posted in Crazy Puppy, Empty Nest, Hobby Adventures, House Projects, Making Stuff With Wood and tagged backyard birds, boxermixsquishyface, driveway workshop, empty nest life, Fargo The Terrible, herringbone table, hobby adventures, insulating the shop (garage), making stuff with wood, novice woodworker Weatherwash, playing with the fancy camera, Shanty-2-Chic, taught them to fly, weatherwash by Mara. Bookmark the permalink.